In 1968 the Mother commenced her work on Savitri with Huta. The Mother read out passages from Savitri and then after a deep contemplation gave her comments which were tape-recorded and later transcribed by Huta. The Mother named the work About Savitri. Read about Volumes III and IV, and see a few of the 59 paintings by Huta, in the article by Priti Ghosh after the New Publications section. 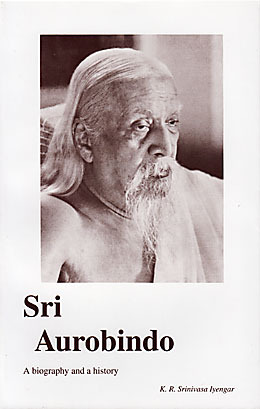 Prof. Iyengar's biography of Sri Aurobindo, long a standard reference work, is now in its fifth edition. The author's subtitle indicates the depth and breadth of the book, as it links the life of Sri Aurobindo, who "played for our age the crucial role of leader of humanity's evolving destiny", with the history of India and the world. It also provides detailed discussions of Sri Aurobindo's writings, from the early poems and plays to the politics of Bande Mataram, from the philosophy and social thought of the Arya to the epic masterpiece of Savitri, as the essential keys to understanding his life and work. This book is available again after a long time. In this interview of May 2003 K. D. Sethna talks about philosophy, poetry and his personal experiences. An article by Sethna, "Poetry and the Poet: A Self-Searching Introduction" is also included. This booklet aims to "quench the intellectual thirst" of those eager to know Sri Aurobindo and the Mother from the perception of one who was in intimate contact with them. The first of two articles in this booklet presents Sri Aurobindo's observations on the works of the Vedic Scholar Max Muller. The second is about Subhas Chandra Bose's "adoration" of Sri Aurobindo as a "spiritual Guru", and their perceptions on the contemporary political situation. Barindra Kumar Ghosh, younger brother of Sri Aurobindo, was a leader of the revolutionary movement in Bengal. He spent ten years in prison in the Andamans, and later lived for six years in the Sri Aurobindo Ashram before settling in Bengal. He was involved in various literary activities in different languages, much of which has recently come to light. This booklet is a compilation of some of his articles on a variety of themes revolving around India, her destiny, and the evolution of man. In December of 1973, entreated by many friends and sadhaks, Pranab gave a talk regarding the last days of the Mother's life, carefully describing events as he personally observed and experienced them, and answering some of the questions that had been put to him by many people after the Mother left Her body. This published version of his talk addresses many of those difficult questions in simple and direct terms and gives a vivid sense of Pranab's service to the Mother. Dans ce " Commentaire sur la Bhagavad-Gîtâ ", Sri Aurobindo nous présente les protagonistes de la bataille du Kurukshetra, telle qu'elle est dépeinte dans le Mahâbhârata. Mais c'est principalement la relation entre Shrî Krishna, l'Avatâr, et Arjuna, son disciple et ami, qu'il décrit. Leur dialogue, qui forme le corps de la Gîtâ, nous livre un message dont la portée est universelle. Car le conflit qui ébranle Arjuna, quand il prend conscience de l'ampleur de la destruction qui se prépare, est celui de l'Homme, lorsque s'effondrent toutes ses valeurs. dit Shrî Krishna. S'en remettre tout entier au Seigneur Suprême, dans un amour où toute distance est abolie, tel est le moyen de recevoir la vraie connaissance et de découvrir une loi d'action plus divine. Dans ces histoires racontées aux enfants de l'Ashram, Pournapréma nous parle de la vie de Douce Mère, depuis sa naissance jusqu'à sa rencontre avec Sri Aurobindo. These conversations with the Mother were noted down from memory by Mona Sarkar. They were originally held in French, and took place in the late 1960s. The contents include, among others, "Mother  The Supreme", "The Mother's Voice", "The Mother's Feet" and "The Luminous Gaze of the Supreme". As expressed in the introductory note, "In spite of the human incapacity to convey the true value of Her words, ... these talks, it has been felt, reflect Her Light and Her Force; they bring something of Her Presence." The book contains numerous photographs of the Mother. This book consists mainly of short written statements by the Mother on various aspects of spiritual life. The subjects include: the Divine, the Gods and Nature; religion, occultism, wealth and government; progress, perfection and transformation; illness and health; prayers and messages. The statements are compiled from the Mother's notes, messages and correspondences. The volume also includes about thirty brief conversations. Beginning in 1968 the Mother would read out passages from Savitri, go into a deep contemplation, and then give her comments and explanations, which were tape-recorded and later transcribed by Huta. The Mother named the work About Savitri. 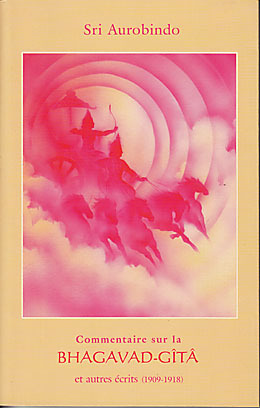 In 1972 Huta offered to the Mother copies of About Savitri, Part One (now out of print), consisting of Book One Canto One. The Mother's message for the book was: "Savitri  The supreme revelation of Sri Aurobindo's vision." Part Two of About Savitri consisting of Book One Canto Two was published in 2000 (also now out of print). We present here Parts Three and Four of About Savitri, consisting of Book One Canto Three and part of Book One Canto Four, with the Mother's explanations on the passages, and including altogether 59 paintings by Huta inspired and approved by the Mother. The Mother had vigorously clapped Huta’s hands between Hers, while meditating with her in Her interview room in the Playground in the early 1950s, to infuse in them a New Consciousness which would express “the beauties and wonders of the higher worlds”, as she would later explain to Huta. And She later revealed: “I have seen the beauties and wonders of the higher worlds. Now I think of expressing them in painting by various colours – blues, golds, pinks and whites – with certain vibrations of Light – all in harmony forming the New World. Huta’s books About Savitri: with some paintings (Volumes III and IV), as titled by The Mother and containing paintings by Huta and commentaries by The Mother based on Book I, Cantos III and IV of Savitri, expound The Mother’s vision, both revelatory and revolutionary, of the Future Painting. All our traditional and inveterate conceptions of Art have to be totally obliterated when we take up these books. A cursory glimpse at the paintings will refuse to reveal anything either. “If you want to enjoy these ‘meditations’,” The Mother said in one of Her messages on Savitri, “you must put aside all conventional notions about art and painting. Turning the pages of these books, the mind falls silent and the contemplation of the paintings on ”The Yoga of the King: The Yoga of the Soul’s Release” from Book I, Canto III (Volume III), and “The Secret Knowledge” from Book I, Canto IV (Volume IV), quieten the heart with glimpses of a distant world gradually revealing its secret beauty. In Volume III, recalcitrant Matter, touched by the promise of Light, is painted in deep reds and green and black in plates 5, 7, 25 and 33, in a way that is not oppressively negative and depressing, as traditionally depicted, but hints at the possible fulfillment of the Supreme’s assurance to Matter. Paradoxically, darkness depicted here is rather fascinating. Nuances of blue and pink lend a soothing dream quality, depicting the more positive experiences; so do vibrant yellows and golds, an assuring touch. 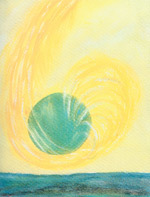 The first descent of an Avatar (plate 8), the human body receiving the Superhuman Consciousness (plate 10), the sense of joy of the New Consciousness touching the world in whirling joyous rings of yellow (plate 14) , and the Divine Presence entering into Matter along with the subsequent paintings (from plate 28 on), all showing the inevitable divinisation of Matter in flowing gold and red, end in a cadence of joy and a sense of liberation. “Coming from the highest world, Savitri knew intuitively what should and would be the possibilities of the beings who will live upon earth.” In plate 11 The Divine Mother in Her eternal solicitude stoops to bless the earth lying prostrate in an immobility of surrender. The suggestive fingers of The Mother in white and pink strokes penetrating into Matter and blessing it portray a theme as old as creation. The restraint and dignity in the use of soft pinks and subdued yellows suffuse the painting with the touch of benign tenderness. Plate 10 depicts a passage from Savitri where the earth, reminiscent of her glorious past, yearns for that “one needed truth (that) eludes her grasp”. In an evocative gesture, the earth, suggested in bright vermilion and green conic forms, raises her mute invocation to the supernal Powers. A certain rhythmic gaiety pervades the painting in the juxtaposition of vermilion and green and yellow as if in anticipation of the fulfillment of her ardent prayer. He is ignorant of his high and splendid fate. And Nature trembles with the power, the flame. Plate 3 pictures the quivering flames, blazing in brilliant red and yellow and green, which seem to storm the earth, lying insignificant, impotent, and shake it out of its somnolence. And leaves its huge white stamp upon our lives. The unflickering white flame in the inner recesses of our heart, spreading its calm radiance in soft violets and pinks to the nether regions of our being, soothes us with a quietude and calmness (plate 4). 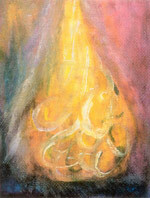 The quick swirling strokes have almost an audio-visual effect. As one gazes long at the swiftness of the strokes, one can almost hear and see the pacing of the hooves as they dig deep and leave their imprint on the trampled breast of Life. Throughout this canto which depicts the working of the New Consciousness on Matter, the colours of the paintings seem rather loud and pronounced, to punctuate perhaps the powerful pressing over the earth of this New Consciousness, specially in plates 3, 6, 7, and 18. 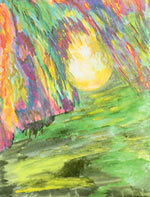 The colours are startlingly bold and dynamic in their application. “In its superficial appearance this world is chaotic and haphazard,” says The Mother in Her comments with Plate 12. An obstinate and resistant Matter, shown in dark oppressive colours, is penetrated by the emanating white rays of the sun, which are rather sketchy and incomplete. “The true world is ready behind the apparent confused and chaotic world that we know,” The Mother emphasises. Behind the chaotic screen of a colourful melee of strokes, vehement in its clamour of confusion, the peeping of a semi-hidden world lends a promise of hope, as the light green touches in the foreground suggest (plate 16). 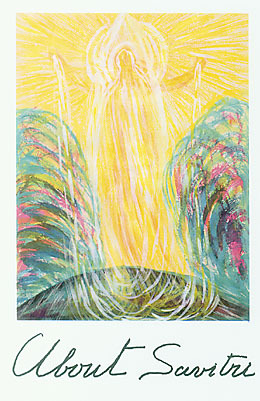 The direct penetration of the spiritual sun, indicated by the central ray entering the illuminated Matter, and painted in golden yellow, destroys all the scepticism of a negating and resistant Matter (plate 17). “This is the magnificent promise”, The Mother says, “that cheers you up in whatever difficulties come on the way. These books are indeed “meditations”. In one of Her messages to Huta referring to Book I, Canto I, The Mother said, “Savitri, this prophetic vision of the world’s history, including the announcement of the earth’s future. – Who can ever dare to put it in pictures? “Yet, The Mother and Huta have tried it, this way. “We simply meditate together on the lines chosen, and when the image becomes clear, I describe it with the help of few strokes, then Huta goes to her studio and brushes the painting.